Casual Friday: Obama vs. McCain--FIGHT! OK, so they barely resemble the real candidates. But I did spend close to an hour trying to get the perfect look for these two. Barack always struck me as a Jeet Kun Do master: nimble, deadly with his words--and with a pair of nunchucks. McCain? This guy's tough as nails. I don't know if I could've made it through half the stuff&#160;he did, so, of course, I have to equip him with the biggest mallet available. (Disclaimer: The author denies any knowledge of martial arts training&#160;on the part of&#160;either presidential candidate and avers that this game in no way replaces real political discourse.) Ready? FIGHT! 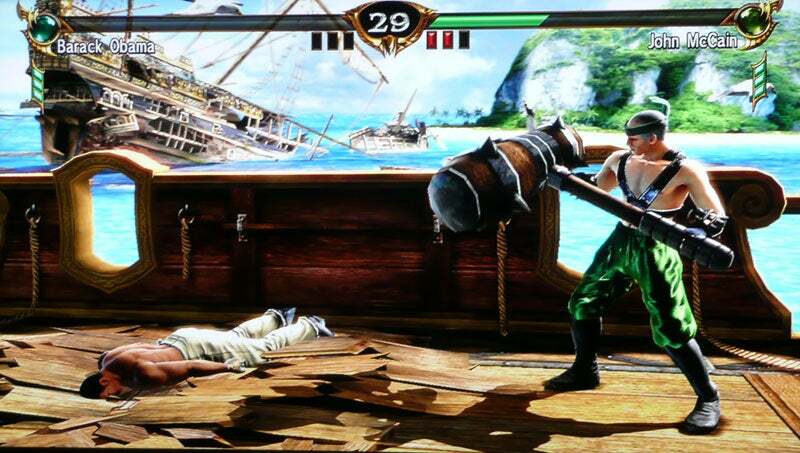 First round goes to the guy with the mallet. Barack has youth on his side, so of course he's dancing rings around McCain. And the strategy is paying off, at first. He gets a couple combos, laying out a full plan on modernizing the military and&#160;ending stop-loss practices. But stand still too long, and the cagey Vietnam vet is gonna deliver a haymaker: his mile-long service record. BOOM! Well, that, and the mammoth mallet McCain lugs around probably isn't hurting his cause, either. Getting frozen is a huge motivator. The only drilling happening on the Arctic shelf today: a couple nunchuck shots to the head. Both candidates are seeing green these days--seeking cleaner fuels--but here's the billion-dollar question: Do you tear up your own natural resources in the meantime, or do you work out deals with foreign powers? 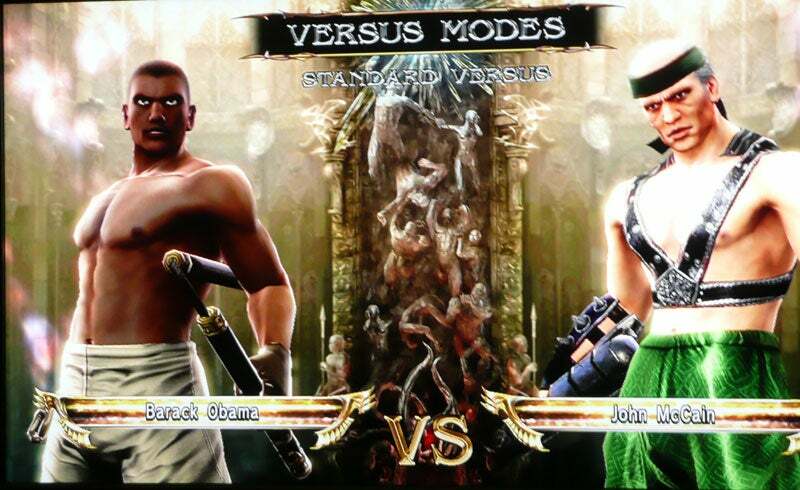 This could be anybody's fight, but a shirtless Obama is getting cold--so he makes quick work of McCain. This is still anybody's fight. As our boys continue duking it out over the worldwide issues here,&#160;stuff like&#160;video games legislation&#160;usually falls to each fighter's "cut man" (y'know, VP running mates). And that's what really scares me. While nobody has officially been named yet, neither side is looking promising. In one corner, you could have Hil-Rod. She still has an axe to grind with Grand Theft Auto--a game not made for kids is apparently corrupting them. In the other corner (at least according to an item on the&#160;Reuters site) could be the fun-killing terminator, Mitt Romney. 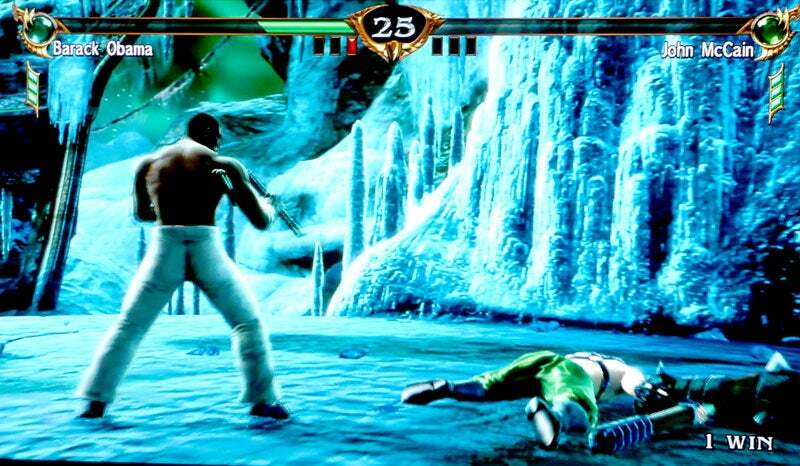 The guy makes it sound&#160;as if&#160;all video games are a cesspool of filth, according to one report. All jokes aside for a second, there are a number of other politically charged games out there. Some are innocuous time-wasters draped in politics. Some educate. Some enrage. Some are listed right here for your slackery convenience. And all of 'em are free. A pro tip: Shoot vetos through the House floor and hide underneath. 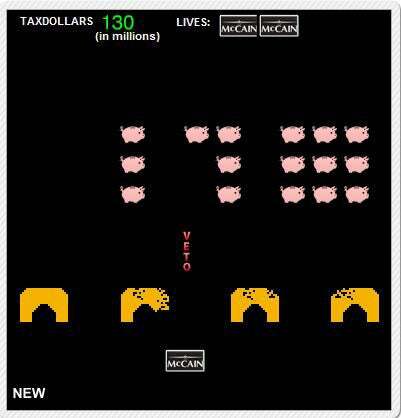 The McCain-centric Space Invaders clone has you controlling a McCain logo that fires vetos up at pork-barrel flying pigs that rain down...arrows? Here's where the GOP failed: I would much rather have seen a Monty Python-style animated McCain head shouting those vetos up at the pigs. The great current events game-makers at Persuasive Games put together a simple game of pong, as played by your favorite candidates. (Shockwave required.) Each political player has his own presidential power-up. Don't look for any hidden messages here. No sir. It doesn't have the catchiest name for a puzzle game, but it's still fun. 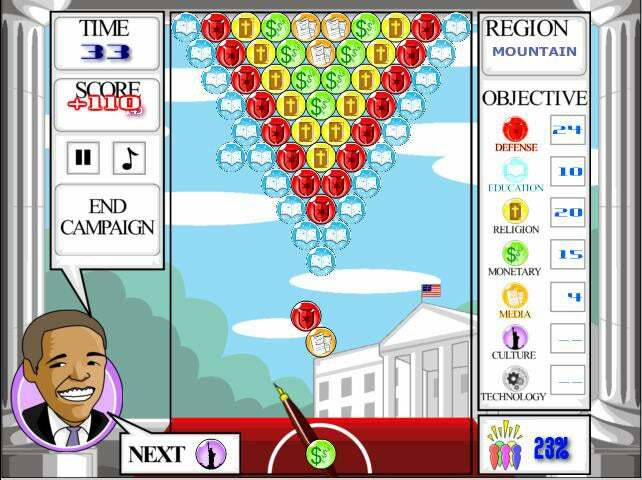 Though Obama's illustrated head is all over this game, it really is a version of the arcade/Web game, Bust-A-Move. The idea: you match up political issues and make them disappear from the screen. If only life were that easy.